Veggie souperfood! This recipe was adapted from a traditional Italian family recipe given to me by Aldo, a family friend who used to run one of the best Italian restaurants in Perth. Ours is done meatless with an appetising burst of flavours. It’s also a feast for the eyes with its visually pleasing carousel of colours. 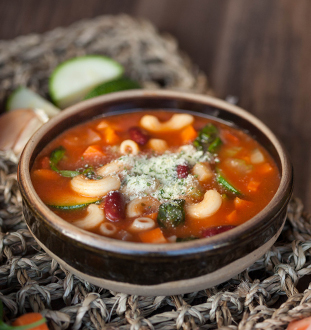 Vegetable stock (water, root vegetables, herbs), whole peeled tomatoes, tomato paste, round cabbage, onions, zucchini, red kidney beans, carrots, celery, macaroni (durum wheat), parmesan cheese, potatoes, leeks, garlic, basil, salt, sugar, vegetable oil, herbs and spices.